The central banks of the world are acting as if it is 2008 all over again. Desperate times call for desperate measures, and right now the central bankers are pulling out all the stops. The Federal Reserve, the European Central Bank, the Bank of England, the Bank of Canada, the Bank of Japan and the Swiss National Bank have announced a coordinated plan to provide liquidity support to the global financial system. According to the plan, the Federal Reserve is going to substantially reduce the interest rate that it charges the European Central Bank to borrow dollars. In turn, that will enable the ECB to lend dollars to European banks at a much cheaper rate. The hope is that this will alleviate the credit crunch which has gripped the European financial system by the throat. So where is the Federal Reserve going to get all of these dollars that it will be loaning out at very low interest rates? You guessed it – the Fed is just going to create them out of thin air. Our currency is being debased so that Europe can be helped out. Unfortunately, the impact of this move will be mostly “psychological” because it really does nothing to address the fundamental problems that Europe is facing. It is up to Europe to solve those problems, and so far Europe has shown no signs of being able to do that. The major central banks of the world say that they want to “enhance their capacity to provide liquidity support to the global financial system.” But essentially what is happening is that the Federal Reserve is going to be zapping large amounts of dollars into existence and loaning them out to the ECB very, very cheaply. Think of it as a type of “quantitative easing” on a global scale. The decision to do this was reportedly made by the Federal Reserve on Monday morning. For the moment, this move seems to have stabilized the European financial system. It is quite unlikely that any major European banks will fail this weekend now. But as mentioned above, this move does nothing to solve the very serious financial problems that Europe is facing. This intervention by the central banks is merely just a speed bump on the road to financial oblivion. Most Americans are not going to understand what the central banks of the world just did, but it really is not that complicated. The following is how CNN chief business correspondent Ali Velshi broke down what the central banks have done…. In an attempt to stave off the consequences of a global credit freeze, the Federal Reserve, in coordination with major central banks, has created a credit line available to those central banks, whereby they can borrow dollars at reduced interest rates for periods of three months. The central banks, in turn, can lend to commercial banks in their respective countries. This is meant to reduce the cost of short-term borrowing for troubled European banks and to give them immediate access to dollars. This was done immediately after the collapse of Lehman Brothers as well, to alleviate the consequences of banks being largely unwilling to lend to other banks, even for short periods, for fear that the borrowing banks could fail. 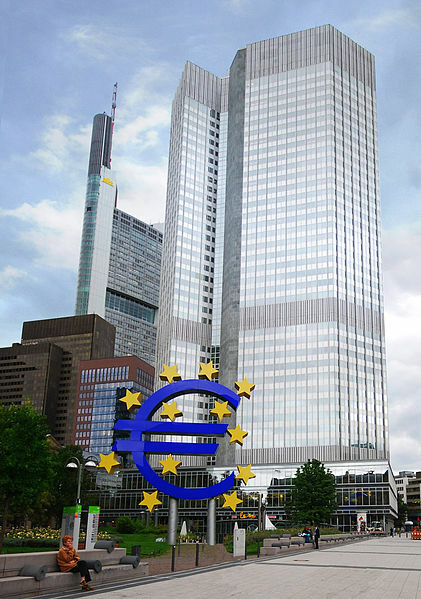 Okay – so the Federal Reserve is loaning giant piles of cheap money to the European Central Bank. So where in the world does all of that money come from? As a CNBC article recently explained, all of this money is created right out of thin air by the Federal Reserve…. Neither the dollars nor the Euros come from anywhere. They aren’t moved or debited from anywhere. They are invented right on the spot with a few taps on the key pad. And that’s all. There’s no printing press fired up to make new dollars or euros. This is sometimes called “fiat money.” But that makes it sound as if some command from a sovereign created the money. It’s really closer to “keyboard money,” since it is created by data entry in a computer. Does that sound bizarre to you? But that is how the global financial system really works. We live in a crazy world. So what did the financial markets of the world think of this move by the Federal Reserve? It turns out that they absolutely loved it. The Dow was up 490 points, and that was the biggest gain of the year so far. Unfortunately, this stock market rally is not going to last indefinitely. If you are still in the market, enjoy this while you can because eventually a whole lot of pain is going to be coming. Again, nothing has been solved. Europe is still in a massive amount of trouble. But the announcement did make everyone feel all “warm and fuzzy” for at least a day. Michelle Girard, a senior economist at RBS Securities, said the following about this move…. Just think of it as “comfort food” for the financial markets. It was also a very desperate move. In fact, some even believe that this move happened because a major European bank was in danger of failing. Just check out some of the things that Jim Cramer of CNBC has been saying on Twitter…. If the Fed didn’t act we would have had the largest bank failure ever this weekend, i believe. The actions the governments took today shows that there was without a doubt a major bank about to fall this weekend. That’s very dire…. I believe a major European bank would have gone under this weekend…. That’s why they did this…. An article in Forbes has also speculated that this move was made because a major European bank was in imminent danger of failing…. Did a big European bank come close to failing last night? European banks, especially French banks, rely heavily on funding in the wholesale money markets. Given the actions of the world’s largest central banks last night, it raises the question of whether a major bank was having difficulty funding its immediate liquidity needs. Perhaps we will never know the truth, but the reality is that the Federal Reserve and the European Central Bank would have never taken coordinated action like this if they did not believe that there was some sort of imminent threat to the global financial system. Sadly, this latest move is also going to have some side effects. Pimco senior vice president Tony Crescenzi says that all of this “liquidity” is going to dramatically increase the size of the U.S. monetary base…. Keep in mind that any use of the Fed’s swap facility expands the Fed’s monetary base: all dollars, no matter where they are deposited, whether it be Kazakhstan, Japan, or Mexico, wind up back in an American bank. This means that any time a foreign central bank engages in a swap with the Federal Reserve, the Fed will create new money in order to make the swap. Use of the Fed’s liquidity swap line in late 2008 was the main cause of a surge in the Fed’s monetary base at that time. The peak for the swap line was about $600 billion in December 2008. Some observers will therefore say that the swap line is a backdoor way to engage in more quantitative easing. When there is more money floating around out there but the same amount of goods and services, prices go up. So will we eventually see more inflation in the United States because of all this? That is what some are fearing. Meanwhile, politicians in Europe have failed to come up with a plan to address the European financial crisis once again. They are calling it a “delay”, but the truth is that it should be called a “failure”. The following comes from an article in USA Today…. The ministers delayed action on major financial issues — such as the concept of a closer fiscal union that would guarantee more budgetary discipline — until the heads of state meet next week in Brussels. So will European politicians come up with a real plan next week in Brussels? The reality is that this latest move by the major central banks of the world does not change the fact that Europe is in a huge amount of trouble and is most likely headed for a very painful financial collapse. One more thing that this latest move by the central banks of the world highlights is the fact that we do not have any control over what they do. All of these central banks are run by unelected bureaucrats that answer to nobody. The decisions that these central bankers make affect all of our lives in a very significant way, and yet we have zero input into these decisions. Most of the decisions that these central bankers make seem to benefit big banks and big financial institutions. They always claim that the benefits will “filter down” to the rest of us. But most of the time what ends up filtering down to us is the economic pain that comes from their bad decisions. As I have written about so many times before, these central banks need to be abolished. The American people need to tell Congress to shut down the Federal Reserve and to start issuing debt-free United States currency. We do not want a bunch of unelected central bankers to “centrally plan” the U.S. economy or to “centrally plan” the global economy. The more these central bankers monkey with things, the more they mess things up. Yes, this latest move has stabilized things for the moment, but big trouble is on the horizon for the global financial system.